Dave Grohl and the band set the record straight with a mockumentary-style video. 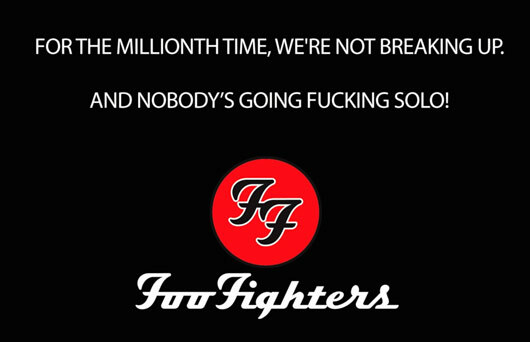 Foo Fighters have released a video of their "big announcement" and it turns out they were having us on. The band teased news on their Twitter account yesterday, amid rumours they were splitting up, but it turns out they just decided to have a big laugh at the media's expense. The mockumentary-style video sees Dave Grohl going it alone without the aid of his guitar, or frankly, any musical talent whatsoever. Meanwhile the remainder of the Foos decide to stick it out together and think about who to enlist as their new frontman, with Gwen Stefani being thrown into the ring. Plus The Newlyweds star Nick Lachey even does a cameo and sings the Foos classic track, Everlong. So puts an end to the rumours then!